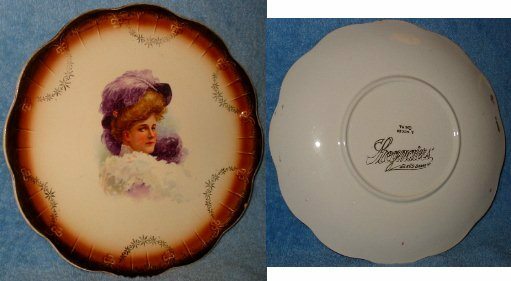 Limoges China Plate – Stegmaier pre-prohibition limoges china plate. 9 inch round. Plate has no cracks or chips and retains good color. There is small scratch on her cheek you can see in the photo. There is uniform fine crazing throughout. This one was in my Stegmaier collection for years until I finally found one a little nicer. There are 2 different lady plates. This one and a lady with dark hair.